Leek Fritters with Carrot and Turmeric are one of the best winter appetizers I’ve created so far. This is a game changer recipe that can make anyone LOVE leeks. These leek fritters have a wonderful yellow color coming from turmeric. Yes, I’ve found a new recipe to hide turmeric. Nobody will be aware of it in these fritters. Everyone will focus so much on the creamy center and they won’t question the source of its color. After learning its health benefits, I might be a bit obsessed with this amazing spice as I use it wherever possible or even impossible as in the Banana Turmeric Chocolate Cake I made last year. Don’t worry if there are picky eaters in your family. I promise even they will love these leek fritters. These are crispy on the edges and soft and creamy in the center. The best way of including leeks in your family’s diet. I mean who doesn’t love crispy and creamy fritters? 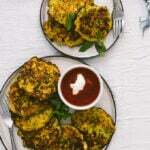 Fritters are considered as a summer treat as they are typically made with zucchini. Another staple in a fritters recipe for me is feta and we mostly have zucchini fritters with feta as a part of our breakfast for dinner during summer. You know I love to make changes on classic recipes and I’ve ended up with several yummy fritters recipes. Have you seen my Feta Quinoa Zucchini Fritters recipe or Corn and Avocado Fritters recipe? You need to check them out too if you love fritters as much as we do. I came up with the idea of these Leek Fritters with Carrot and Turmeric when I was thinking of a good way to help my husband eat leeks. Our 3-year-old son and I don’t have any problems with any vegetables. The picky eater in our family is my husband. He never refuses to eat whatever I cook but I know he doesn’t eat some vegetables willingly at all. Leek is one of these. Well, it used to be. He loved these fritters so much that he asked for the leftovers the next day. Unlike classic zucchini fritters recipe, it’s better to cook leeks and carrots before adding them into the batter. Otherwise, they won’t cook well and you won’t have a creamy center in your fritters. We love to have these either with a hot chili sauce, yogurt or even both. I think everyone can love any food with the right recipe. If there is someone in your family refusing to eat leeks, try these leek fritters. Heat 2 tablespoons olive oil in a large nonstick skillet. Saute leek and carrot in it over medium-high heat until tender, about 5 minutes. Transfer it on a plate and let cool. Meanwhile, whisk eggs, flour, baking powder, salt, black pepper and turmeric. Stir in sauted leek and carrot. Add in crumbled feta, sesame seeds and stir until combined. Heat 1 and ½ tablespoons vegetable oil in the same skillet you saute the vegetables. Drop ¼ cup of batter into the hot skillet. Gently flatten the fritters using the bottom of a cup or a spatula. Cook until bottoms are golden, about 3 minutes. Using a spatula, flip the fritters over and cook about 2 minutes. Transfer on a paper towel. Repeat with another 1 and ½ tablespoons oil and remaining batter. Serve warm with hot chili sauce or yogurt. You can cook chopped leeks and grated carrot one day ahead, cover and keep in the refrigerator to use the next day. These fritters are good when they are cold too, so you don’t need to heat them up if you have any leftovers. Your photos look really good. They make me want to eat fritters right now. I’m trying to use more turmeric in recipes so I’m going to try this recipe. Looks delicious. Great week dinner idea and great photos, too ! Thank you and have a pleasant day ! Thank you! These are one of our favorite meatless dinners. So easy too. My family loves fritters too. Such a versatile meal because you can change the vegetables or change the sauce! I haven’t tried leek in fritters so I’ll have to try this soon. They look delicious. I’m also very keen to include turmeric in everything since I learnt how good it is for you! Isn’t it great that you can make fritters with almost all vegetables? You can make changes depending on the season. And believe me turmeric goes well in these fritters.